What is a beignet? 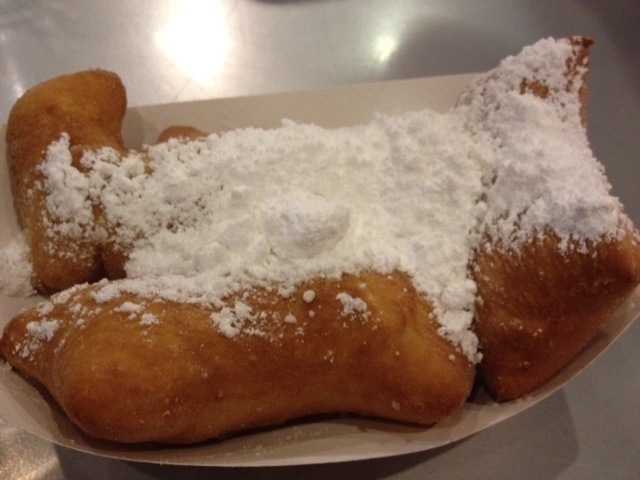 Beignets are deep fried dough covered with powered sugar. They are soft pillows of yumminess. 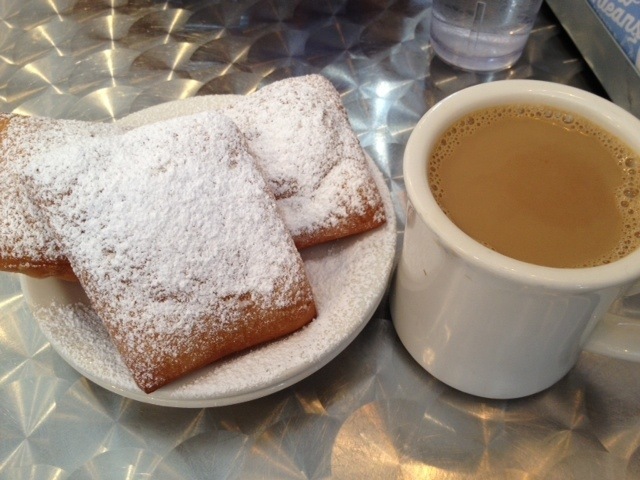 You can’t visit New Orleans without stopping at Cafe du Monde for beignets and a cafe au lait. This is where everyone goes and it is a fun experience. Although the lines can be long, they tend to move quickly. Service and orders come just as quick. In no time, your beignets and coffee are at your table. My ritual is taking a bite of the beignet and then alternating each bite with a dunk into my coffee. The beignets at Cafe du Monde are warm and doughy as I remembered from my last trip to NOLA which was Pre-Katrina. I must have asked for some beignets with my powdered sugar. I leave my plate, my pants, and the ground in a white mess. I took the St. Charles Streetcar to get to the New Orleans Coffee & Beignet Co. Unlike Cafe du Monde, this place is quiet and relaxing. The beignets are made to order and came out piping hot. It had plenty of powdered sugar, but they do leave tables with sugar dispensers in case you didn’t think you had enough. The beignets were light and crispy. My cafe au lait was delicious as well. 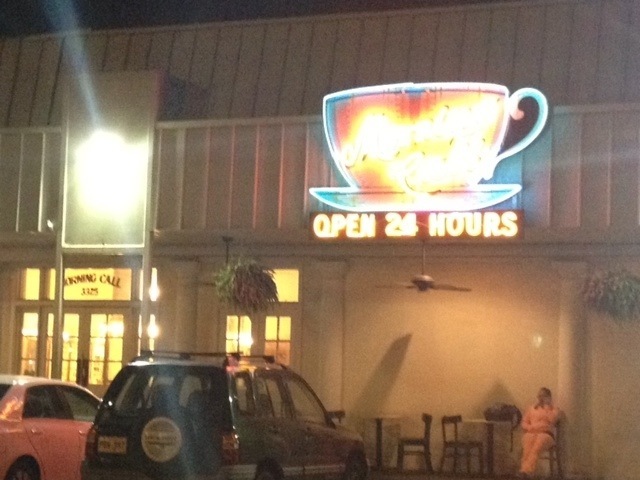 My friend and I took a cab to Morning Call, a 24 hour coffee shop that also specializes in beignets. I guess there is more than one Morning Call and our cab driver took us out of New Orleans to a town called Metairie for these delectable treats. 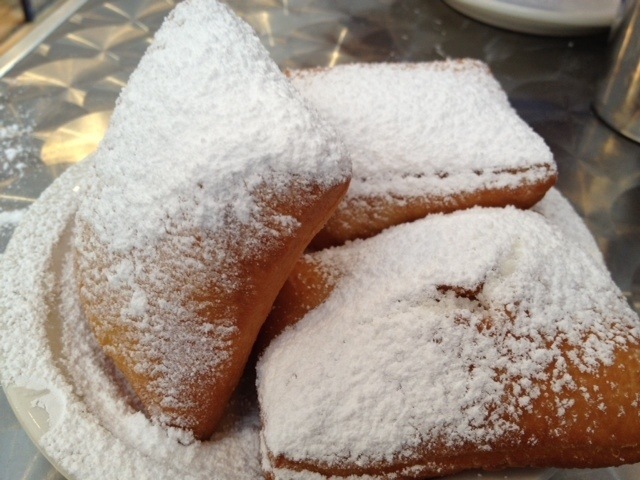 The beignets were very similar to the ones at New Orleans Coffee & Beignet Co., light and crispy. 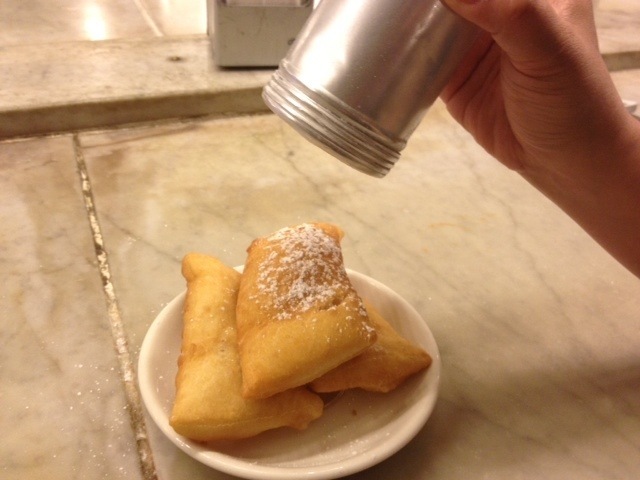 Here you powder your own beignets. It was late night so I was happy to have a decaf cafe au lait. 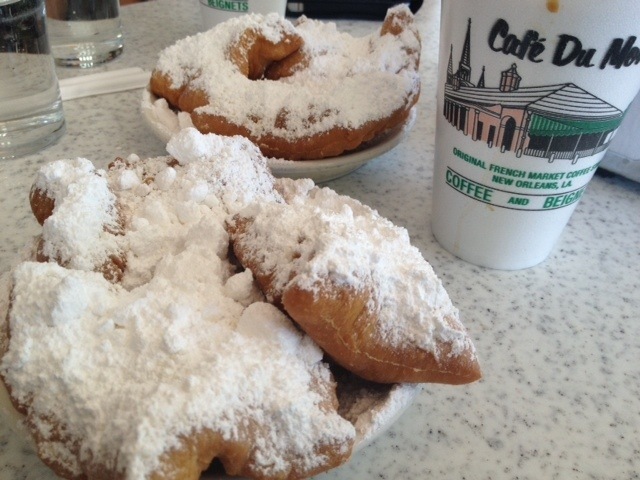 With the cab fare, let’s just say these were the priciest beignets ever. I thought that was the last of the beignets on this trip, but it wasn’t. Before you leave town, you can get some beignets at the Louis Armstrong New Orleans International Airport. West Beignet was our last beignet stop. The cashier is the same woman who makes the beignets and she seemed to have a chip on her shoulder. These beignets tasted pretty good, but the inconsistent shape made them less attractive. Although we were at the airport, these beignets were surprisingly inexpensive. If you must have a final fix of beignets before you leave town, it’s worth a try. 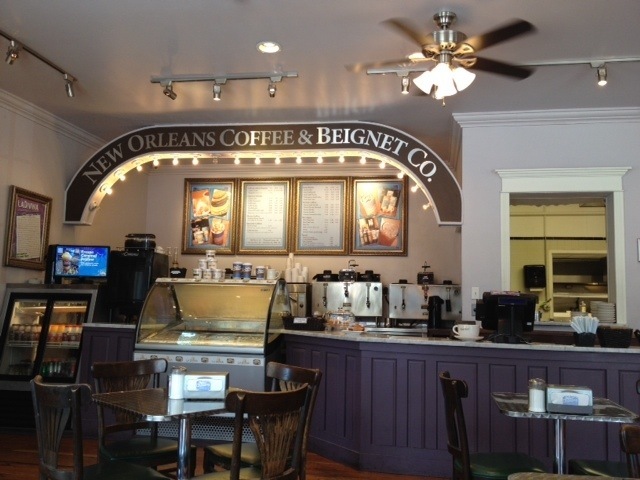 The search is over, my favorite place to get beignets is from the New Orleans Coffee & Beignet Co. I am rating this on everything from the beignet, the cafe au lait, the environment, as well as the transportation to get there. airport beignets cafe au lait cafe du Monde Metairie morning call New orleans new Orleans coffee & beignet co.